SUPERIOR DESIGN FEATURES FOR THIS PREMIUM BICYCLE REPAIR STAND. It features fully adjustable height up to 5 feet, impressive aluminum alloy arm and a large tool tray with compartments to hold all your hardware and tools. This is a very portable stand that can be folded up and put away in a compact space. STAND MAKES IT EASIER TO PERFORM REPAIRS without having to bend over a bicycle or hang upside down while you work on wheels and gears. No need to balance your bike on a work bench or turn it on its seat and handlebars to access wheels and tires. This saves your back, neck, and arms from pain and injury. 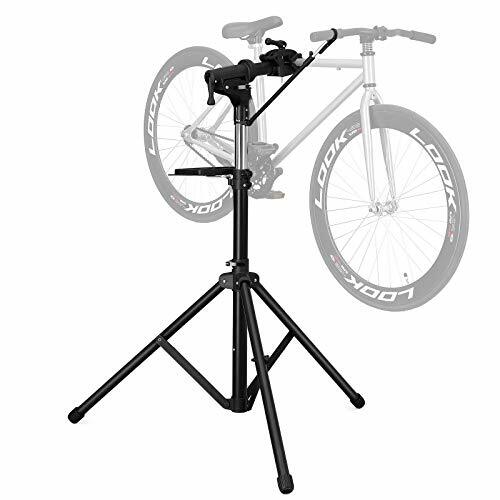 Now you can use a fully professional bike repair stand like used in countless repair shops. You will appreciate being able to have your bike presented at just the right height for easier, faster, and more effective work. Pretty soon you will be repairing and adjusting bikes for all your friends and co-workers. MAKES A GREAT GIFT for anyone who likes to do their own bike repairs and adjustments. This rack is essential for anyone who cycles for sport, in competition, or for regular exercise and transportation. HURRY AND BUY NOW while we have this exceptional repair stand in stock. Get yours and find out why many professional repair techs and competition cyclists insist on these advanced features, superior design, and high quality materials. - Before moving the repair stand, please remove your bicycle. - During repair or assembly, do not move the 3 legs of this stand.